This is my favourite children’s book, although I didn’t know what genre it is till I posted a book review of Dovey Coe. I have to thank my sister who always pick up good random used books. Serendipity and frugality send blessings our way. The Coes is a picture of a typical, happy family whose ancestors lived in North Carolina for many years ago. 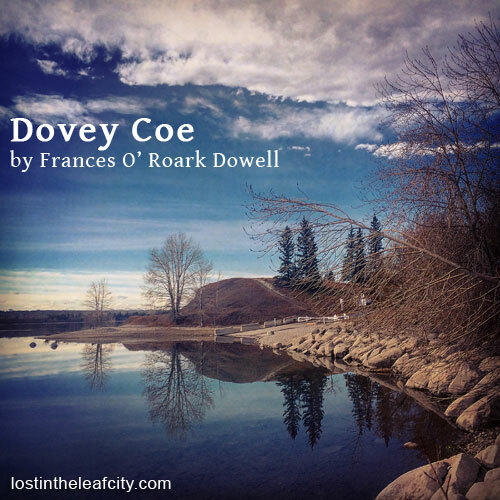 Dovey Coe, the title and the heroine of the novel written by Frances O’ Roark Dowell, narrates how peaceful and simple her life living up in the mountain. Dovey and her deaf brother Amos, who is a year older than her, love to explore the forest while evading harmful creatures. From their trip, they take home stones, feathers, and other things they thought interesting and can be acquired without being harmed. At home, Dovey does chores with her older sister Caroline the muse of the family and of the whole town. Together, they explore the less adventurous and not so interesting place for Dovey—the town, where Caroline becomes the center of attention while the younger sister keeps herself busy criticizing her sister’s admirers dumbfounded by the beauty that she too wondered often but not envy. Her mother does a fine job in upbringing and taking care of them, while her father is a good provider. No matter how simple the conversation is, Frances makes the story engaging to read because of Dovey’s quality that sets her apart from her peers: she likes to speak her mind. Such trait adds color to her family’s life—up in the mountain. But down to the town, things are different. It’s a good thing Dovey is equipped with her talent of speaking her mind. I like how she defends her brother Amos when people mock at him or belittle their family—this part is best done by the Caraways, the richest family in town. Frances O’ Roark Dowell makes the story livelier by adding such well-off, arrogant family. I must admit: I, too, was exasperated by them, but triumphed whenever Dovey scores through her witty reply. This folks whom Dovey in no way longs to cross path with, ironically threatens the life of her family as Parnell Caraway tried hard to be one of them. As the plot thickens, I laud Frances O’ Roark Dowell on how she puts an innocent child as Dovey Coe in a courtroom, where her quality of voicing thoughts if use wisely can prove her innocence—of a crime. The way I see it, her word is a weapon that she wields well in an ordinary battle with her peers or reasoning with her parents, yet this weapon has to be useful and of greater value for her freedom is at stake—the liberty to scour the mountain and most importantly living in North Creek with her ever-supportive family. Speaking up one’s mind, as I learned from the story must be done at the right place, time, and motive whether you’d like to simply point out something or defend someone. To put it into practice, I’d like to give my honest opinion in few words though not as intelligent as Dovey’s: I recommend Dovey Coe for everyone because her fancy from the beginning to the end range from interesting, funny to engaging, smart. When was the last time you were like Dovey Coe, saying your thoughts out loud? « Book Gifting, If You Dare!